Buy Call of Duty Black Ops 3 for the best price PS4 has never been easier! 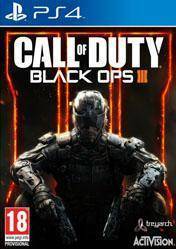 This product is a PS4 (Playstation 4) physical version for Call of Duty Black Ops 3, the expected delivery of the Black Ops series, belonging to one of the most successful franchises in recent times, Call of Duty franchise. The story follows the events of Black Ops 2, where after an attack drones (unmanned) has begun the development of a impenetrable air defense system, so the fighting will take place on land. We will can to improve the skills of soldiers through all kinds of gadgets, increases bio, bionic and robotic enhancements, and all kinds of implants grant superhuman abilities our soldiers. The reasons for the war are the usual, climate change and scarcity of raw materials lead to new alliances and factions, so the story mode too surprised either. In multiplayer mode, the most anticipated game mode will bring a new and improved motion system. With many options for improvement, our soldiers will be able to make runs, jumps, sprints, slide down the walls while we shoot our guns. Moreover, we can choose specializations that comply with our character to a particular style of play. I play this game only for the Zombies. I have the season pass and I'm having a lot of fun with it. Multiplayer is meh and is filled with lots of dlc weapons you can only get from supply drops. Haven't tried Campaign and I don't think I will.